Between hosting SNL, starring in one of 2018’s most successful movies, and dancing up a storm on the red carpet, it’s a wonder that Jason Momoa has any time for his wife, Lisa Bonet, and their three kids. But in an adorable video he shared this week, the actor proved that he always puts family before anything else. Especially when it comes to his uma, or grandmother. The actor has admitted he’s a “grandma’s boy” in the past, and even shared photos of himself talking to his grandmother Mabel on FaceTime from the set of Aquaman. Momoa, who was raised in Iowa, where Mabel still lives, obviously has a deep connection to his grandma. The actor made time in his busy schedule to pay her a visit, and uploaded a video of himself bonding with her at a care home in Iowa. Momoa’s mother, Coni, tagged along for the trip, and the camera caught some precious moments between them during the drive over. “You’re the king of the u-turns,” she fired back. 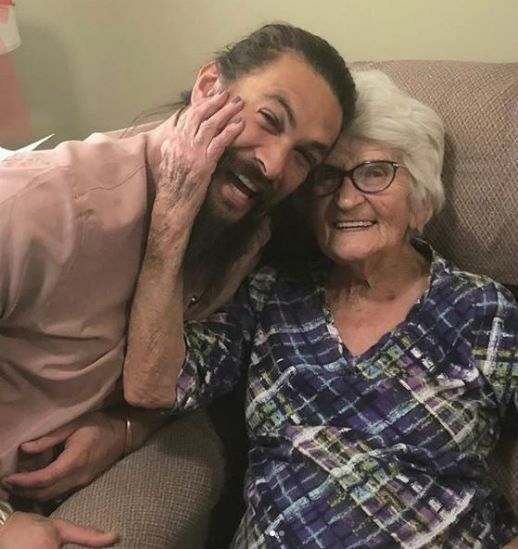 At the care home, Momoa brought a smile to his grandma’s face. He gave her wheelchair a spin before pushing her through the halls. They even shared a quiet moment together, basking in the sunshine beside the windows. “It’s perfect,” Momoa said as he nuzzled his head against hers. The video was a special look into a side of Momoa’s life that he doesn’t often share. Momoa also filmed himself taking a detour to visit one of his favorite local breakfast spots, The Waveland Cafe, for a decadent plate of hash browns. Hey, when you look like Jason Momoa you can eat all the carbs you want. And, obviously, he stopped to take a lot of selfies throughout the trip. That’s only natural when the film you starred in just crossed the $1 billion mark. The actor’s fans were touched by the video, and how down to earth the Hollywood star seemed in it. “That’s a true Iowa boy loving on his grandma,” one commented. “The realest dude in Hollywood spreading aloha to his family. What’s not to love about this man who raises up the women in his life and cherishes his littles?” wrote another. What did you think of Momoa’s visit with his grandma?